Technology instructions for Gibble Auditorium in Esbenshade. If you experience any problems, call ext. 3333 or e-mail the Help Desk at mediaservices@etown.edu. 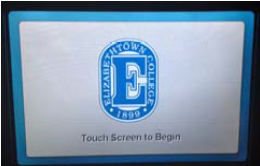 Please visit our web site at http://www.etown.edu/ITS for additional information. Note: Non-classroom events must be scheduled through 25Live. The computer is located in the cabinet behind the podium. 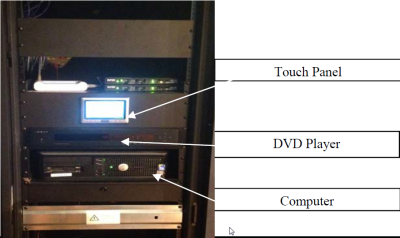 Step 1:Press anywhere on the touch panel to turn on the panel screen (on the wall behind the podium). You have the option of using 3 screens in Gibble. 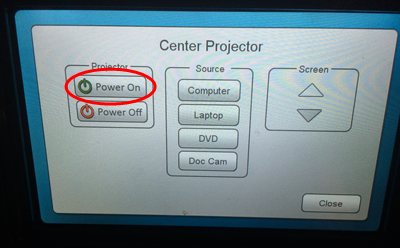 Step 2:Press the power button on the front of the computer. Log on with your network username and password. Warning: The computer resets upon upon restart and shut down. Save your files to the network or removable media only. 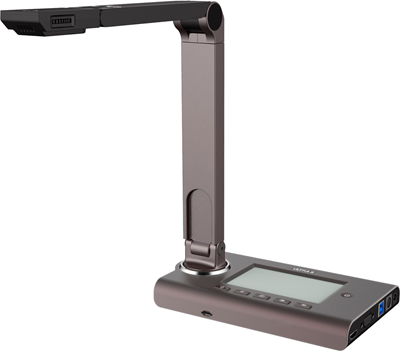 The document camera in Gibble is the HoverCam Ultra8. 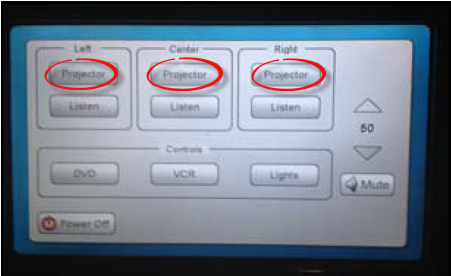 Step 1:Turn on the any or all of the projectors from the touch panel on the wall behind the podium. Press the Doc Cam button on the touch panel. It may take a minute or two for the image to show up on the projector screen. 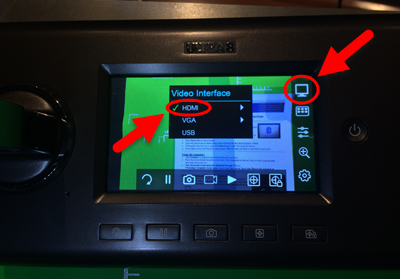 Note: If you have waited a minute after pressing the Doc Cam button and you still do not see an image on the projector screen, check to see if the Ultra8's video interface is set to HDMI. 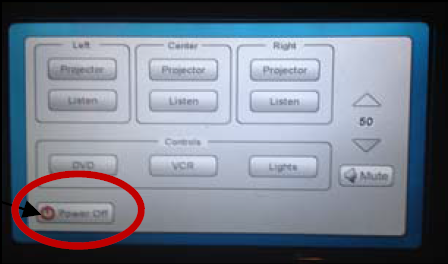 To change the video interface, press the monitor icon in the top right corner of the screen, and select HDMI. Step 1:Press Projector under Left, Center, or Right on the touch panel for the projector you would like to turn on. 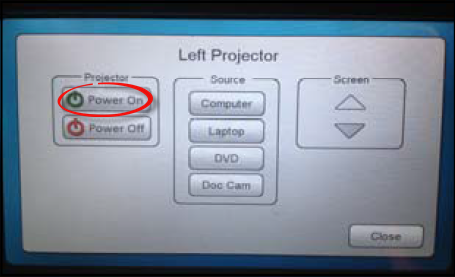 Step 2:Press Power On for that projector. Step 3:Select which source you will need for that projector screen. 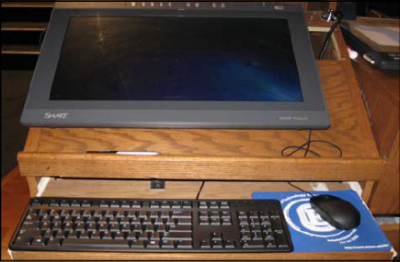 Step 4:Press Close on the touch panel to return to the main menu. Repeat Steps 1-3 for each projector you would like to use. 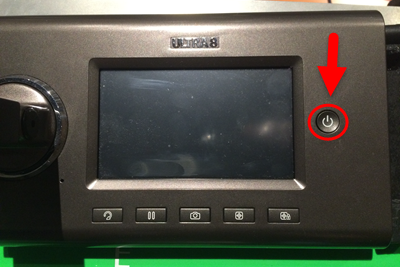 Step 1:Press the Power Off button on the touch screen. Step 2:Touch Power Off to confirm that you want to power off the system. 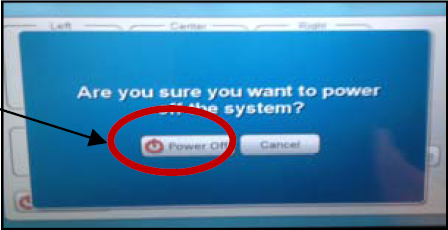 Step 3:Turn the computer off by clicking the Start menu button and selecting the Shutdown option. Choose Shutdown in the dialog box and click OK. Step 4:If you want to turn the projector on again, give the machine several minutes to cool down before restarting it. Press Lights on the touch panel. 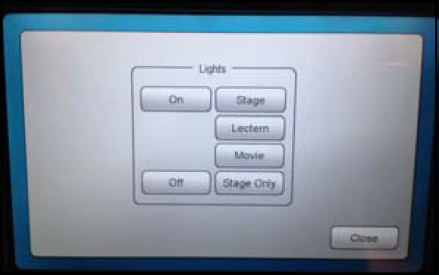 You can control the lights on the stage, lectern, movie, and stage only.